Visitor is reading Only if your HIGH!! Visitor is reading म मातेको रात ! Visitor is reading Is this conspiracy of Galaxy School? Please log in to subscribe to Alishagrg's postings. They do raise water buffalo in oregon. Every now and then, bhutani, nepali folks near seattle team up and head to oregon , रांगा ढाल्नको लागि। Last time i tried buff sukuti was in Thakali restaurant in new york. I did ask the guy where they got their buff, guy said it's not actually water buffalo, its bison. Tasted pretty much same though. Please log in to subscribe to tallagheremaila's postings. Please log in to subscribe to evilinside's postings. @AlishGrg, Which city are you from? If you are closer to Atlanta and ready to pickup in person I can ask if they have availability ? Please log in to subscribe to Sajha keto's postings. 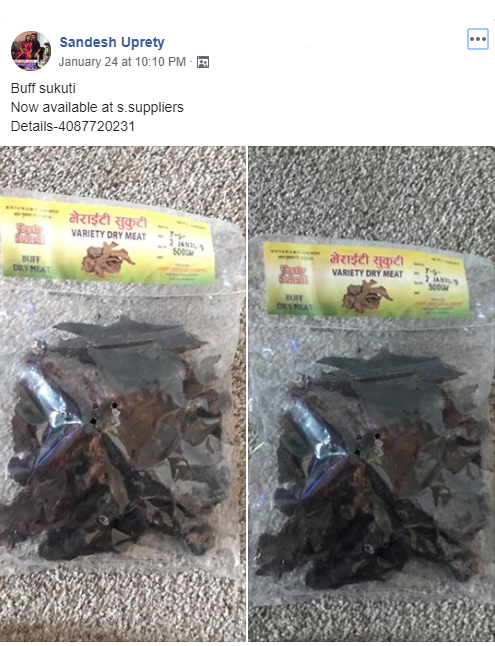 I saw one person selling sukuti at a good price of $20 for 500 grams.